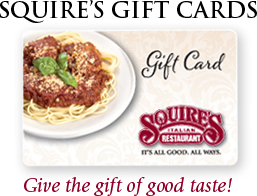 Call Squire’s Italian Restaurant and Catering today and get quality, made from scratch food that is sure to please everyone at your party. Whether you need us to cater to your home, office or in one of our private banquet rooms, we have something for everyone here at Squire’s and want nothing more than to make your event one to remember. From appetizers to hot entrees and even desserts, served in a buffet style to accommodate even the biggest and hungriest crowds! Our private banquet rooms accommodate up to 80 guests. Anything from holiday parties to baby showers, bridal showers to rehearsal dinners. Squire’s Catering does it all!